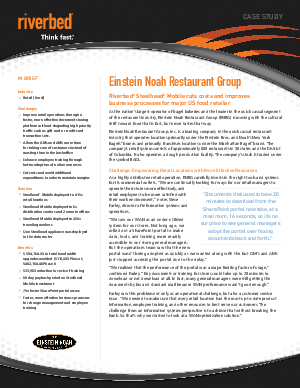 Einstein Noah Restaurant Group (ENRG) wanted to find ways for its retail locations to more effectively leverage its new SharePoint portal and its wide-area network (WAN) for general communications, training, and op­erational changes. ENRG hoped to avoid a major upgrade to its WAN infrastructure, so they looked at WAN optimization software clients as an alternative. After considering three competing products, ENRG chose Riverbed Steelhead Mobile because it provided the best performance, the simplest deployment, and a substantial return on investment. Learn how with Riverbed WAN optimization they decreased their SharePoint document download time from 20 minutes to 16 seconds.